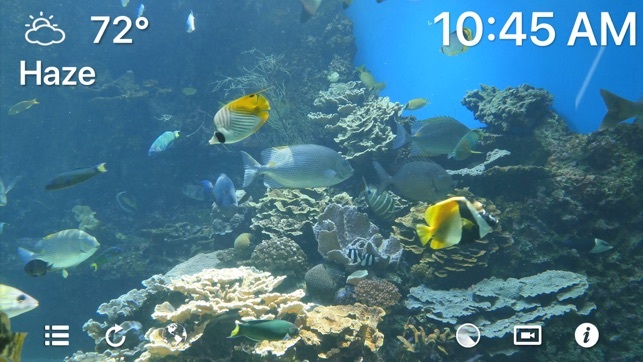 Introducing Aquarium 4K: The most innovative and insanely beautiful Ultra HD Aquarium application ever conceived. Aquarium 4K features over 20 breathtaking 4K Ultra HD videos, with each 4K Videos include a huge variety of exotic fish; including but not limited to: Sting Rays, Jelly Fish, Cat Fish, Clown Fish, Lion Fish, Sea Horses, Alligators, and much more! Also visit a variety of locations around the world the Great Barrier Reef, the Bahamas Barrier Reef, Thailand, and more. 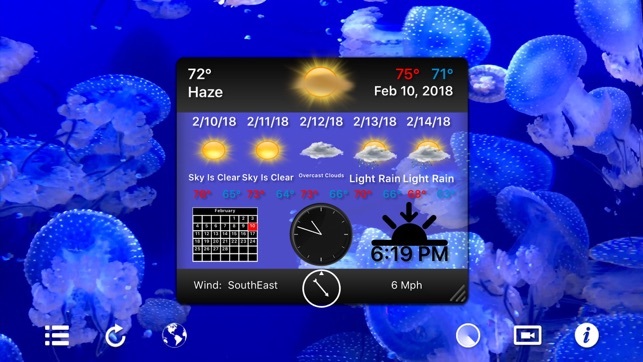 If that wasn't enough, Aquarium 4K also displays weather information, includes a 3D Earth with live data, and even has various Radars to choose from making Aquarium 4K four applications in one. With Aquarium 4K, enjoying real Aquariums has never been so hyper-realistic and enjoyable! 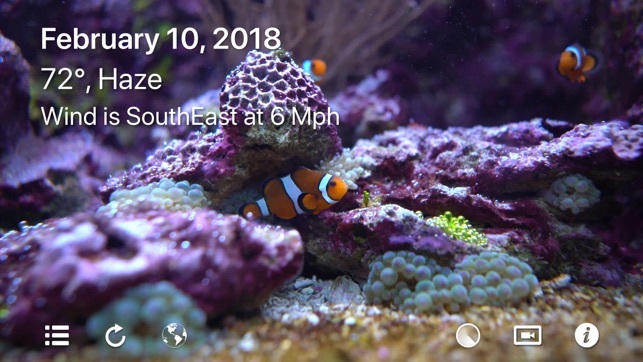 Aquarium 4K can also optionally display useful information such as Weather and Time and allows you to customize on screen Widgets (or no Widgets at all) as well as choosing a custom 4K video super easily. Don't have a lot of hard drive space? No problem! 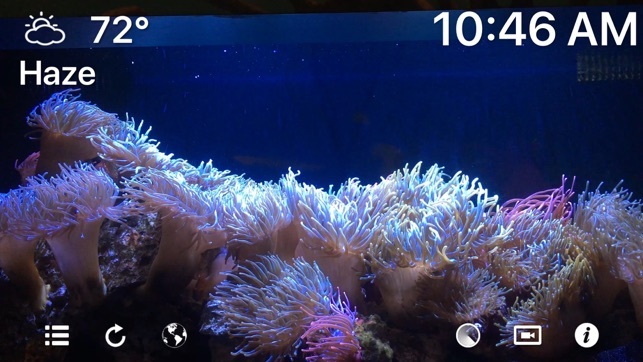 Aquarium 4K takes advantage of the latest iOS technologies to download 4K videos as needed, and if you get low on hard drive space, Aquarium 4K will automatically delete 4K videos that aren't in use* And best of all, Aquarium 4K is Universal, so with one purchase you get the application for iPhone, iPad, and Apple TV! 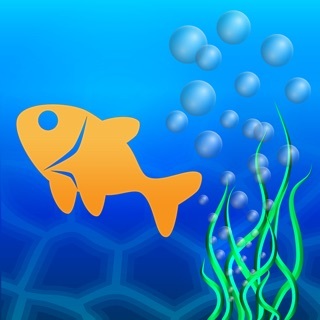 - Incredibly easy to use! The videos appear to be 14 seconds in length and then looped. The videos really aren’t that great, if they are 4K they should be of more stunning subject matter. I could make 4K video of paint drying but that doesn’t mean my video is awesome. Also, my biggest gripe is the time doesn’t stay synced. My main reason for buying this was to have a big clock with a nice background. Well the time starts to lag immediately and after 10 or so minutes the clock is way out of sync. After around 20 min it was about 15 minutes off. I emailed the company but heard nothing. Wasted money. I enjoyed some of the videos and use my Apple TV and mirror cast the video and it looked really good. I would suggest a few items to improve the app. 1. 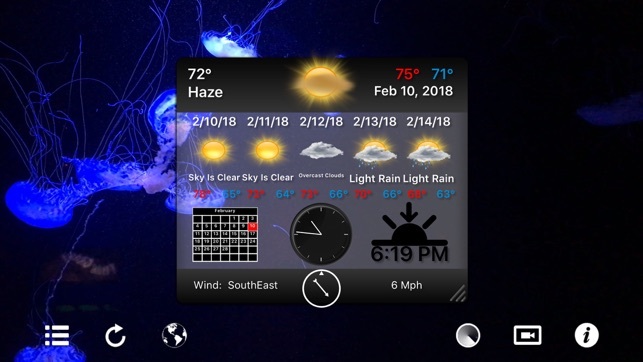 Have a setting to fade the bottom controls away. This is partially distracting from the videos. 2. 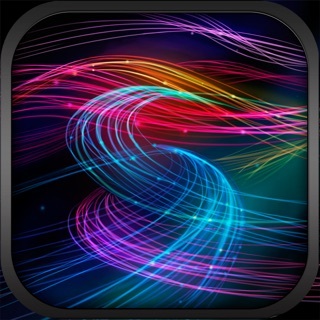 Increase the duration of the video to say five minutes before you looping the video over. DONT BUY! A Good selection but the clips are so short the loop is annoyingly obvious.